Coatings for an implantable medical devices such as stents and methods of fabricating thereof are disclosed. The coatings comprise a biologically absorbable poly(ester amide), which is a polymeric product of a reaction between a diol-diamine and a dicarboxylic acid. This is a continuation application of U.S. application Ser. No. 10/738,704, filed on Dec. 16, 2003, the teachings of which are incorporated herein by reference in their entirety. A problem associated with the above procedure includes formation of intimal flaps or torn arterial linings which can collapse and occlude the conduit after the balloon is deflated. Moreover, thrombosis and restenosis of the artery may develop over several months after the procedure, which may require another angioplasty procedure or a surgical by-pass operation. To reduce the partial or total occlusion of the artery by the collapse of arterial lining and to reduce the chance of the development of thrombosis and restenosis, a stent is implanted in the lumen to maintain the vascular patency. Stents are used not only as a mechanical intervention but also as a vehicle for providing pharmacological therapy. As a mechanical intervention, stents act as scaffoldings, functioning to physically hold open and, if desired, to expand the wall of the passageway. Typically, stents are capable of being compressed, so that they can be inserted through small vessels via catheters, and then expanded to a larger diameter once they are at the desired location. Examples in patent literature disclosing stents which have been applied in PTCA procedures include stents illustrated in U.S. Pat. No. 4,733,665 issued to Palmaz, U.S. Pat. No. 4,800,882 issued to Gianturco, and U.S. Pat. No. 4,886,062 issued to Wiktor. Pharmacological therapy can be achieved by medicating the stents. Medicated stents provide for the local administration of a therapeutic substance at the diseased site. In order to provide an efficacious concentration to the treated site, systemic administration of such medication often produces adverse or toxic side effects for the patient. Local delivery is a preferred method of treatment in that smaller total levels of medication are administered in comparison to systemic dosages, but are concentrated at a specific site. Local delivery thus produces fewer side effects and achieves more favorable results. One proposed method for medicating stents involves the use of a polymeric carrier coated onto the surface of a stent. A solution which includes a solvent, a polymer dissolved in the solvent, and a therapeutic substance dispersed in the blend is applied to the stent. The solvent is allowed to evaporate, leaving on the stent surface a coating of the polymer and the therapeutic substance impregnated in the polymer. Poly(ester amides) as described in U.S. Pat. No. 6,503,538 to Chu et al. are a category of polymers that are well suited for stent coatings. Poly(ester amides) are very biocompatible and are an effective matrix for delivery of drugs. However, improvements can be made to the properties of poly(ester amides). For example, the poly(ester amides) described by Chu et al. 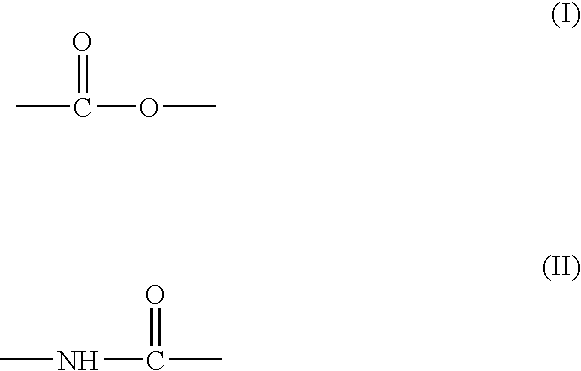 are too soft and tacky causing these poly(ester amides) to adhere to balloon surfaces. In addition, the poly(ester amides) described by Chu et al. tend to flow during ethylene oxide (ETO) sterilization process. Accordingly, there is a need to have poly(ester amides) with improved hardness, increased ability not to adhere to balloon surfaces and higher degree of resistance to flow during the process of ETO sterilization. A medical article comprising an implantable substrate having a coating is provided, the coating includes a polymeric product of a reaction between a diol-diamine and a dicarboxylic acid. The diol-diamine can be a product of condensation of an amino acid and a diol. Examples of amino acids that can be used for making the diol-diamine include glycine, alanine, valine, isoleucine, leucine, phenyl alanine, methionine, asparagine, glutamine, proline, and mixtures thereof. Examples of diols that can be used for making the diol-diamine include ethylene glycol, 1,2-propanediol, 1,3-propanediol, 1,4-butane diol, 1,5-pentanediol, 1,6-hexanediol, 1,7-heptanediol, 1,8-octanediol, 1,9-nonanediol, 1,10-decanediol, 1,11-undecanediol, and 1,12-dodecanediol, and mixtures thereof. Examples of dicarboxylic acids that can be used for reacting with the diol-diamine include oxalic acid, malonic acid, succinic acid, glutaric acid, adipic acid, pimelic acid, suberic acid, azelaic acid, sebacic acid, undecanedioic acid, dodecanedioic acid, brassylic acid, tetradecanedioic acid, pentadecanedioic acid, thapsic acid, and mixtures thereof. wherein R is selected from a group consisting of hydrogen; methyl, iso-propyl, sec-butyl, iso-butyl, benzyl, methyl mercaptoethyl, methylene amide, and ethylene amide; x is an integer having a value between 2 and 16; y is an integer having a value between 0 and 16; and n is an integer having a value between 35 and 1,100.
wherein x is an integer having a value between 2 and 16; y is an integer having a value between 0 and 16; and n is an integer having a value between 35 and 1,100. A method for fabricating a medical article is provided, the method includes synthesizing a condensation copolymer and forming a coating comprising the copolymer on at least a portion of an implantable substrate, the synthesizing of the copolymer including reacting a diol-diamine with a dicarboxylic acid. The term “biologically absorbable” coatings and/or polymers is defined as coatings and/or polymers that are capable of being completely degraded, dissolved, and/or eroded when exposed to bodily fluids such as blood and are gradually resorbed, absorbed and/or eliminated by the body. The processes of breaking down and eventual absorption and elimination of the coating and/or polymer can be caused, for example, by hydrolysis, enzymatic action, oxidation, phagocytosis, metabolic processes, bulk or surface erosion, and the like. Whenever the reference is made to “biologically absorbable” stent coatings and/or polymers forming such stent coatings, it is understood that after the process of degradation, dissolution, erosion, absorption, and/or resorption has been completed, no coating will remain on the stent. The term “condensation copolymer” is defined as a copolymer that is a product of a process of polycondensation of two monomers. “Polycondensation” is defined in accordance with the definition used by the IUPAC (the International Union for Pure and Applied Chemistry.” The IUPAC defines “polycondensation” as a process of polymerization in which the growth of polymer chains proceeds by condensation reactions between molecules of all degrees of polymerization (Definition 3.7). (d) a finishing coat layer. Any of the layers of the stent coating can be formed on the stent by dissolving the condensation copolymer or a blend of condensation copolymers in a solvent, or a mixture of solvents, and applying the resulting copolymer solution on the stent by spraying or immersing the stent in the solution. After the solution has been applied onto the stent, the coating is dried by allowing the solvent to evaporate. The process of drying can be accelerated if the drying is conducted at an elevated temperature. To incorporate a drug into the reservoir layer, the drug can be combined with the copolymer solution that is applied onto the stent as described above. Alternatively, to fabricate a polymer free reservoir, the drug can be dissolved in a suitable solvent or mixture of solvents, and the resulting drug solution can be applied on the stent by spraying or immersing the stent in the drug solution. Instead of introducing the drug as a solution, the drug can be introduced as a colloidal system, such as a suspension in an appropriate solvent phase. To make the suspension, the drug can be dispersed in the solvent phase using conventional techniques used in colloid chemistry. Depending on a variety of factors, e.g., the nature of the drug, those having ordinary skill in the art can select the solvent to form the solvent phase of the suspension, as well as the quantity of the drug to be dispersed in the solvent phase. The suspension can be mixed with a condensation copolymer solution and the mixture can be applied on the stent as described above. Alternatively, the drug suspension can be applied on the stent without being mixed with the copolymer solution. The drug-polymer layer can be applied directly onto at least a part of the stent surface to serve as a reservoir for at least one active. agent or a drug which is incorporated into the reservoir layer. The primer layer can be applied between the stent and the reservoir to improve the adhesion of the drug-polymer layer to the stent. The topcoat layer can be applied over at least a portion of the reservoir layer and serves as a rate limiting membrane which helps to control the rate of release of the drug. In one embodiment, the topcoat layer can be essentially free from any active agents or drugs. If the topcoat layer is used, the optional finishing coat layer can be applied over at least a portion of the topcoat layer for further control of the drug release rate and for improving the biocompatibility of the coating, for example, for providing the surface of the coating with anti-thrombotic and/or non-fouling properties. Without the topcoat layer, the finishing coat layer can be deposited directly on the reservoir layer. In one embodiment, any or all of the layers of the stent coating, can be made of a condensation copolymer that is both biologically beneficial and biologically degradable, erodable, absorbable, and/or resorbable polymer. In another embodiment, just the outermost layer of the coating can be limited to such a polymer. To illustrate in more detail, in the stent coating having all four layers described above (i.e., the primer, the reservoir layer, the topcoat layer and the finishing coat layer), the outermost layer is the finishing coat layer, which is made of a condensation copolymer that is biologically degradable, erodable, absorbable, and/or resorbable. In this case, optionally, the remaining layers (i.e., the primer, the reservoir layer, the topcoat layer) can be also fabricated of a biologically degradable condensation copolymer; and the copolymer can be the same or different in each layer. If the finishing coat layer is not used, the topcoat layer can be the outermost layer and is made of a biologically degradable condensation copolymer. In this case, optionally, the remaining layers (i.e., the primer and the reservoir layer) can be also fabricated of a biologically degradable condensation copolymer; and the copolymer can be the same or different in each of the three layers. If neither the finishing coat layer nor the topcoat layer is used, the stent coating can have two layers, the primer and the reservoir. The reservoir in this case is the outermost layer of the stent coating and can be made of a biologically degradable condensation copolymer. Optionally, the primer can be also fabricated of a biologically degradable condensation copolymer. The two layers can be made from the same or different materials. Biologically absorbable condensation copolymers that can be used for making any of the stent coating layers include poly(ester amides) (PEA). The synthetic techniques that can be used for obtaining the PEAs are described below. Generally, the PEAs are products of reaction between one precursor-reagent of group A and one precursor-reagent of group B. According to embodiments of this invention, the precursor-reagents of group A include various diol-diamines, and the precursor-reagents of group B include various dicarboxylic acids. In some embodiments, the coating can be free from any particular poly(ester amide). The precursor-reagents of groups A and B are characterized as follows. wherein R can be hydrogen, methyl, iso-propyl, sec-butyl, iso-butyl, benzyl, methyl mercaptoethyl (CH2—CH2—S—CH3), methylene amide (CH2—CO—NH2), or ethylene amide (CH2—CH2—CO—NH2), and x can be an integer between 2 and 16. The reagents described by formula (III) are diol-diamines that can be synthesized by condensation of an amino acid and a diol. The synthesis can be carried under the conditions favoring esterification of the amino acid via the amino acid's carboxyl group. The reaction can be conducted under dehydrating conditions which include anhydrous environment and an elevated temperature, for example, about 50° C. The reaction can be catalyzed by a strong acid or base, e.g., p-toluenesulfonic acid. Anhydrous conditions can be obtained by the removal of water via an azeotropic distillation of the reaction solvent, e.g., toluene or benzene. The diol that can be used to make diol-diamines having formula (III) has the formula HO—(CH2)x—OH, where x is defined above. Representative examples of diols that can be used include ethylene glycol, 1,2-propanediol, 1,3-propanediol, 1,4-butane diol, 1,5-pentanediol, 1,6-hexanediol, 1,7-heptanediol, 1,8-octanediol, 1,9-nonanediol, 1,10-decanediol, 1,11-undecanediol, 1,12-dodecanediol, or mixtures thereof. The amino acid that can be used to prepare diol-diamines having formula (III) has the formula H2N—CHR—COOH, where R is defined above. Some amino acids that can be used are summarized in Table 1. In addition to amino acids listed in Table 2, alternatively other amino acids can be used, for example, proline (2-pyrrolidine carboxylic acid). Either one amino acid or two different amino acids can be used to synthesize diol-diamines having formula (III). If one amino acid is used, two molar equivalents of the amino acid can be used per one molar equivalent of a diol described above. If two different amino acids are used, one molar equivalent of the first amino acid plus one molar equivalent of the second amino acid are used per one molar equivalent of a diol. wherein y can be an integer between 0 and 16. Some examples of dicarboxylic acids described by formula (IV) that can be used are summarized in Table 2. Mixtures of the carboxylic acids presented in Table 2 can be also used, if desired. As mentioned above, to synthesize the PEAs, at least one reagent of group A can be reacted with at least one reagent of group B. Coupling the diol-diamines directly with the dicarboxylic acids can be accomplished by using acid or catalysis under dehydrating conditions. To conduct the process of coupling with fewer side reactions, the dicarboxylic acid can be preliminarily activated with a carbodiimide, such as 1,3-dicyclohexylcarbodiimide (DCC), or 1-(3-dimethylaminopropyl)-3-ethylcarbodiimide hydrochloride (EDC). Alternatively, instead of a dicarboxylic acid, a derivative thereof, such as diacid chloride, diacid bromide, or p-nitrophenol derivative, can be used. wherein R, x, and y are as defined above, and n is an integer having a value between about 35 and about 1,100, for example, between 90 and 650.
wherein x, y, and n are as defined above. One example of the process of synthesis of poly(ester amide) having general formula (V), can be the synthesis of the poly(ester amide) based on alanine, adipic acid, and 1,6-hexanediol according to the following procedure. First, two equivalents of L-alanine can be combined in the benzene solution with one equivalent of 1,6-hexanediol, and with at least two equivalents of p-toluenesulphonic acid. Instead of benzene, toluene or chloroform can be used, if desired. The mixture can be heated to reflux and azeotropic distillation utilizing a Dean-Stark trap can be used to remove generated water. As a result, the di-p-toluenesulphonic acid salt of the bis-(L-alanine)-1,6-hexylene diester (monomer 1) can be obtained. Next, adipic acid can be activated by reacting one equivalent of adipoyl chloride with two equivalents of p-nitrophenol, in the tetrahydrofuran (THF) solution, with at least two equivalents of triethylamine, to obtain di-p-nitrophenyl adipate (monomer 2). Instead of THF, diethylether or p-dioxane can be used, if desired. Both monomer 1 and monomer 2 can have stoichiometry as close as to 1:1 as possible in order to reach high molecular weights. Finally, one equivalent of monomer 1 can be reacted with one equivalent of monomer 2 and at least two equivalents of triethylamine in dry N,N-dimethylacetamide (DMAC). Alternatively, dimethylformamide (DMF) or dimethylsulfoxide (DMSO) can be used instead of DMAC. The ratio of monomers 1 and 2 can, but need not, be 1:1. Generally, the molar ratio of the two monomers is within 10% of each other, depending on the desired molecular weight of the final polymer. The ratio can deviate from 1:1, but in case of deviation the polymerization stops at a lower molecular weight. After combining the reactants at room temperature, the mixture can be heated with stirring at about 80° C. for about 16 hours. The viscous reaction mixture can be cooled to room temperature, diluted with a quantity of alcohol (such as methanol or ethanol) at least equal to the reaction volume, and poured into water. As a result, the final polymer, co-poly-[N,N′-adipoyl-bis-(L-alanine)-1,6-hexylene diester] can be produced. The precipitated polymer can be isolated, washed with water, and dried under vacuum. Any layer of the stent coating can contain any amount of the biologically absorbable condensation copolymers described above, or a blend of more than one of such copolymers. If less than 100% of the layer is made of the biologically absorbable condensation copolymers described above, alternative polymers can comprise the balance. It is preferred that the alternative polymer be biodegradable but it can also be non-biodegradable. Examples of the alternative polymers that can be used include polyacrylates, such as poly(butyl methacrylate), poly(ethyl methacrylate), and poly(ethyl methacrylate-co-butyl methacrylate), and fluorinated polymers and/or copolymers, such as poly(vinylidene fluoride) and poly(vinylidene fluoride-co-hexafluoro propene), poly(N-vinyl pyrrolidone), poly(hydroxyvalerate), poly(L-lactic acid), polycaprolactone, poly(lactide-co-glycolide), poly(hydroxybutyrate), poly(hydroxybutyrate-co-valerate), polydioxanone, polyorthoester, polyanhydride, poly(glycolic acid), poly(D,L-lactic acid), poly(glycolic acid-co-trimethylene carbonate), polyphosphoester, polyphosphoester urethane, poly(amino acids), cyanoacrylates, poly(trimethylene carbonate), poly(iminocarbonate), co-poly(ether-esters), polyalkylene oxalates, polyphosphazenes, biomolecules (such as fibrin, fibrinogen, cellulose, starch, collagen and hyaluronic acid), polyurethanes, silicones, polyesters, polyolefins, polyisobutylene and ethylene-alphaolefin copolymers, vinyl halide polymers and copolymers (such as polyvinyl chloride), polyvinyl ethers (such as polyvinyl methyl ether), polyvinylidene chloride, polyacrylonitrile, polyvinyl ketones, polyvinyl aromatics (such as polystyrene), polyvinyl esters (such as polyvinyl acetate), copolymers of vinyl monomers with each other and olefins, e.g., poly(ethylene-co-vinyl alcohol) (EVAL), ethylene-methyl methacrylate copolymers, acrylonitrile-styrene copolymers, ABS resins, and ethylene-vinyl acetate copolymers; polyamides (such as Nylon 66 and polycaprolactam), alkyd resins, polycarbonates, polyoxymethylenes, polyimides, polyethers, epoxy resins, polyurethanes, rayon, rayon-triacetate, cellulose, cellulose acetate, cellulose butyrate, cellulose acetate butyrate, cellophane, cellulose nitrate, cellulose propionate, cellulose ethers, and carboxymethyl cellulose. The therapeutic substance which can be used in the reservoir layer can include any substance capable of exerting a therapeutic or prophylactic effect for a patient. The therapeutic substance may include small molecule substances, peptides, proteins, oligonucleotides, and the like. The therapeutic substance could be designed, for example, to inhibit the activity of vascular smooth muscle cells. It can be directed at inhibiting abnormal or inappropriate migration and/or proliferation of smooth muscle cells to inhibit restenosis. Examples of therapeutic substances that can be used include antiproliferative substances such as actinomycin D, or derivatives and analogs thereof (manufactured by Sigma-Aldrich of Milwaukee, Wis., or COSMEGEN available from Merck). Synonyms of actinomycin D include dactinomycin, actinomycin IV, actinomycin I1, actinomycin X1, and actinomycin C1. The active agent can also fall under the genus of antineoplastic, anti-inflammatory, antiplatelet, anticoagulant, antifibrin, antithrombin, aritimitotic, antibiotic, antiallergic and antioxidant substances. Examples of such antineoplastics and/or antimitotics include paclitaxel (e.g. TAXOL® by Bristol-Myers Squibb Co., Stamford, Conn.), docetaxel (e.g. Taxotere®, from Aventis S.A., Frankfurt, Germany) methotrexate, azathioprine, vincristine, vinblastine, fluorouracil, doxorubicin hydrochloride (e.g. Adriamycin® from Pharmacia & Upjohn, Peapack N.J.), and mitomycin (e.g. Mutamycin® from Bristol-Myers Squibb Co., Stamford, Conn.). Examples of such antiplatelets, anticoagulants, antifibrin, and antithrombins include sodium heparin, low molecular weight heparins, heparinoids, hirudin, argatroban, forskolin, vapiprost, prostacyclin and prostacyclin analogues, dextran, D-phe-pro-arg-chloromethylketone (synthetic antithrombin), dipyridamole, glycoprotein IIb/IIIa platelet membrane receptor antagonist antibody, recombinant hirudin, and thrombin inhibitors such as ANGIOMAX (Biogen, Inc., Cambridge, Mass.). Examples of such cytostatic or antiproliferative agents include angiopeptin, angiotensin converting enzyme inhibitors such as captopril (e.g. Capoten® and Capozide® from Bristol-Myers Squibb Co., Stamford, Conn.), cilazapril or lisinopril (e.g. Prinivil® and Prinzide® from Merck & Co., Inc., Whitehouse Station, N.J.); calcium channel blockers (such as nifedipine), colchicine, fibroblast growth factor (FGF) antagonists, fish oil (omega 3-fatty acid), histamine antagonists, lovastatin (an inhibitor of HMG-CoA reductase, a cholesterol lowering drug, brand name Mevacor® from Merck & Co., Inc., Whitehouse Station, N.J.), monoclonal antibodies (such as those specific for Platelet-Derived Growth Factor (PDGF) receptors), nitroprusside, phosphodiesterase inhibitors, prostaglandin inhibitors, suramin, serotonin blockers, steroids, thioprotease inhibitors, triazolopyrimidine (a PDGF antagonist), and nitric oxide. An example of an antiallergic agent is permirolast potassium. Other therapeutic substances or agents which may be appropriate include alpha-interferon, genetically engineered epithelial cells, tacrolimus, dexamethasone, and raparnycin and structural derivatives or functional analogs thereof, such as 40-O-(2-hydroxy)ethyl-rapamycin (known by the trade name of EVEROLIMUS available from Novartis), 40-O-(3-hydroxy)propyl-raparnycin, 40-O-[2-(2-hydroxy)ethoxy]ethyl-rapamycin, and 40-O-tetrazole-rapamycin. The coatings and methods of the present invention have been described with reference to a stent, such as a balloon expandable or self-expandable stent. The use of the coating is not limited to stents, however, and the coating can also be used with a variety of other medical devices. Examples of the implantable medical device, that can be used in conjunction with the embodiments of this invention include stent-grafts, grafts (e.g., aortic grafts), artificial heart valves, cerebrospinal fluid shunts, pacemaker electrodes, axius coronary shunts and endocardial leads (e.g., FINELINE and ENDOTAK, available from Guidant Corporation). The underlying structure of the device can be of virtually any design. The device can be made of a metallic material or an alloy such as, but not limited to, cobalt-chromium alloys (e.g., ELGILOY), stainless steel (316L), “MP35N,” “MP20N,” ELASTINITE (Nitinol), tantalum, tantalum-based alloys, nickel-titanium alloy, platinum, platinum-based alloys such as, e.g., platinum-iridium alloy, iridium, gold, magnesium, titanium, titanium-based alloys, zirconium-based. alloys, or combinations thereof. Devices made from bioabsorbable or biostable polymers can also be used with the embodiments of the present invention. In some embodiments, the device, e.g., the stent, can be made from the copolymers of the invention. wherein n can be between 85 and 95, for example, 90. To synthesize the copolymer (VII), a diol-diamine substance of a family having formula (III) can be reacted with a dicarboxylic acid substance of a family of having formula (IV). The diol-diamine substance can be the di-p-toluenesulphonic acid salt of bis-(L-leucine)-1,6-hexylene diester and can be synthesized by condensation of L-leucine with 1,6-hexanediol using a p-toluenesulphonic acid catalyst. The dicarboxylic acid substance can be the di-p-nitrophenyl derivative of sebacic acid, and can be synthesized by the condensation of p-nitrophenol with sebacoyl chloride. The conditions for the synthesis of the diol-diamine and the dicarboxylic acid substances can be determined by those having ordinary skill in the art. The synthesis of copolymer (VII) can be carried out according to the following procedure. About 100.3 g (0.15 mole) of the di-p-toluenesulphonic acid salt of bis-(L-leucine)-1,6-hexylene diester can be mixed with about 105 ml dry DMAC and can be reacted with about 66.67 g (0.15 mole) of di-p-nitrophenyl sebacinate. The reagents can be combined in a one liter round bottom flask equipped with a mechanical stirrer, a nitrogen inlet and a heated oil bath, at room temperature. About 46.2 ml (0.33 mole) of dry triethylamine can be then added to the flask, with stirring, the temperature of the reaction mixture can be increased to about 80° C., and the solution can be stirred for about 10 hours. The viscous reaction mixture can then be cooled to room temperature, diluted with about 250 ml of ethanol, and slowly added to about 2 liters of de-ionized water with stirring. The polymer can then be isolated by filtration, re-suspended in about 1 liter of deionized water, and again isolated by filtration. The process of re-suspension and filtration can then be repeated. Finally, the polymer can be dried at about 30° C. under reduced pressure overnight. wherein n is between 140 and 160, for example, 150. The copolymer (VIII) can be synthesized in the same manner as the copolymer (VII) described in Example 1, except the 1,4-butanediol derivative can be used instead of 1,6-hexanediol derivative. Specifically, the following synthetic procedure can be used. About 99.13 g (0.15 mole) of the di-p-toluenesulphonic acid salt of bis-(L-leucine)-1,4-butylene diester can be mixed with about 105 ml dry DMAC and can be reacted with about 66.67 g (0.15 mole) of di-p-nitrophenyl sebacinate. The reagents can be combined in a one liter round bottom flask equipped with a mechanical stirrer, a nitrogen inlet and a heated oil bath, at room temperature. About 46.2 ml (0.33 mole) of dry triethylamine can be then added to the flask, with stirring, the temperature of the reaction mixture can be increased to about 80° C., and the solution can be stirred for about 12 hours. The viscous reaction mixture can then be cooled to room temperature, diluted with about 250 ml of ethanol, and slowly added to about 2 liters of de-ionized water with stirring. The polymer can then be isolated by filtration, re-suspended in about 1 liter of deionized water, and again isolated by filtration. The process of re-suspension and filtration can then be repeated. Finally, the polymer can be dried at about 30° C. under reduced pressure overnight. The copolymer (IX) can be synthesized using in the same manner as the copolymer (VIII) described in Example 2, except adipic acid can be used instead of sebacic acid. Specifically, the following synthetic procedure can be used. About 99.13 g (0.15 mole) of the di-p-toluenesulphonic acid salt of bis-(L-leucine)-1,4-butylene diester can be mixed with about 76 ml dry DMAC and can be reacted with about 58.2 g (0.15 mole) of di-p-nitrophenyl adipate. The reagents can be combined in a one liter round bottom flask equipped with a mechanical stirrer, a nitrogen inlet and a heated oil bath, at room temperature. About 46.2 ml (0.33 mole) of dry triethylamine can be then added to the flask, with stirring, the temperature of the reaction mixture can be increased to about 80° C., and the solution can be stirred for about 10 hours. The viscous reaction mixture can then be cooled to room temperature, diluted with about 220 ml of ethanol, and slowly added to about 2 liters of de-ionized water with stirring. The polymer can then be isolated by filtration, re-suspended in about 1 liter of deionized water, and again isolated by filtration. The process of re-suspension and filtration can then be repeated. Finally, the polymer can be dried at about 30° C. under reduced pressure overnight. wherein n is between 250 and 300, for example, 275. To synthesize copolymer (X), a diol-diamine substance of a family having formula (III) can be reacted with a dicarboxylic acid substance of a family of having formula (IV). The diol-diamine substance can be the di-p-toluenesulphonic acid salt of bis-(L-alanine)-1,4-butylene diester and can be synthesized by condensation of L-alanine with 1,4-butanediol using a p-toluenesulphonic acid catalyst. The dicarboxylic acid substance can be the di-p-nitrophenyl derivative of adipic acid, and can be synthesized by the condensation of p-nitrophenol with adipoyl chloride. The conditions for the synthesis of the diol-diamine and the dicarboxylic acid substances can be determined by those having ordinary skill in the art. The synthesis of copolymer (X) can be carried out according to the following procedure. About 86.4 g (Q. 15 mole) of the di-p-toluenesulphonic acid salt of bis-(L-alanine)-1,4-butylene diester can be mixed with about 72 ml dry DMAC and can be reacted with about 58.2 g (0.15 mole) of di-p-nitrophenyl adipate. The reagents can be combined in a one liter round bottom flask equipped with a mechanical stirrer, a nitrogen inlet and a heated oil bath, at room temperature. About 46.2 ml (0.33 mole) of dry triethylamine can be then added to the flask, with stirring, the temperature of the reaction mixture can be increased to about 80° C., and the solution can be stirred for about 16 hours. The viscous reaction mixture can then be cooled to room temperature, diluted with about 205 ml of ethanol, and slowly added to about 2 liters of de-ionized water with stirring. The polymer can then be isolated by filtration, re-suspended in about 1 liter of deionized water, and again isolated by filtration. The process of re-suspension and filtration can then be repeated. Finally, the polymer can be dried at about 30° C. under reduced pressure overnight. (b) the balance, absolute (100%) ethanol. The first composition can be applied onto the surface of bare 12 mm small VISION stent (available from Guidant Corporation). The coating can be sprayed and dried to form a primer layer. A spray coater can be used having a 0.014 round nozzle maintained at ambient temperature with a feed pressure 2.5 psi (0.17 atm) and an atomization pressure of about 15 psi (1.02 atm). About 20 μg of the coating can be applied at per one spray pass. Between the spray passes the stent can be dried for about 10 seconds in a flowing air stream at about 50° C. About 110 μg of wet coating can be applied. The stents can be baked at about 50° C. for about one hour, yielding a primer layer composed of approximately 100 μg of copolymer (VII). (c) the balance, absolute ethanol. The second composition can be applied onto the dried primer layer, using the same spraying technique and equipment used for applying the primer layer, to form the drug-polymer layer. About 120 μg of wet coating can be applied followed by drying and baking at about 50° C. for about 1 hour, yielding a dry drug-polymer layer having solids content of about 110 μg. (b) the balance, absolute ethanol. The third composition can be applied onto the dried drug-polymer layers, using the same spraying technique and equipment used for applying the primer and drug-polymer layers, to form a topcoat layer. About 220 μg of wet coating can be applied followed by drying and baking at about 50° C. for about 1 hour, yielding a dry topcoat layer having solids content of about 200 μg. n is an integer having a value between 35 and 1,100. 2. The polymer of claim 1, wherein the diol-diamine is a product of condensation of two molecules of an amino acid or a mixture of two amino acids and one molecule of the diol. 3. The polymer of claim 2, wherein the amino acid comprises a substance having the formula H2N—CHR—COOH, wherein R is selected from a group consisting of hydrogen, methyl, iso-propyl, sec-butyl, iso-butyl, benzyl, methyl mercaptoethyl, methylene amide, and ethylene amide. 4. The polymer of claim 2, wherein the amino acid is selected from a group consisting of glycine, alanine, valine, isoleucine, leucine, phenyl alanine, methionine, asparagine, glutamine, proline, and mixtures thereof. 5. The polymer of claim 1, wherein the diol comprises a substance having the formula HO—(CH2)x—OH, wherein x is an integer having a value between 2 and 16. 6. The polymer of claim 1, wherein the diol is selected from a group consisting of ethylene glycol, 1,2-propanediol, 1,3-propanediol, 1,4-butane diol, 1,5-pentanediol, 1,6-hexanediol, 1,7-heptanediol, 1,8-octanediol, 1,9-nonanediol, 1,10-decanediol, 1,11 -undecanediol, and 1,12-dodecanediol, and mixtures thereof. 7. The polymer of claim 1, wherein the dicarboxylic acid comprises a substance having the formula HOOC—(CH2)y—COOH, wherein y is an integer having a value between 0 and 16. 8. The polymer of claim 1, wherein the dicarboxylic acid is selected from a group consisting of oxalic acid, malonic acid, succinic acid, glutaric acid, adipic acid, pimelic acid, suberic acid, azelaic acid, sebacic acid, undecanedioic acid, dodecanedioic acid, brassylic acid, tetradecanedioic acid, pentadecanedioic acid, thapsic acid, and mixtures thereof.